Before the introduction of recombinant human GH, provision of GH was limited in the clinical setting and—largely in clinical research—to children with GHD. Over the past 10 yr, the availability of virtually unlimited amounts of GH, has made possible the study of broader indications for its administration. 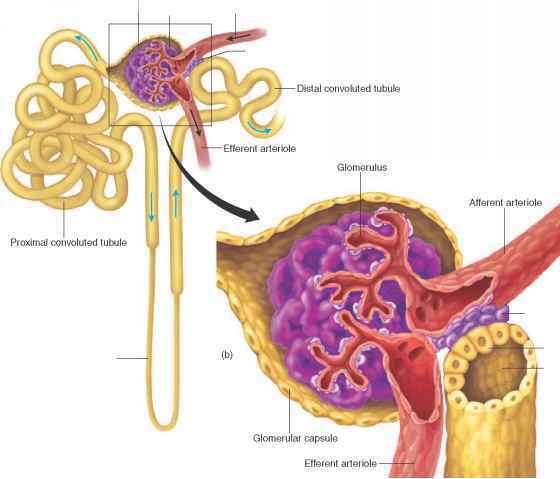 One such area of research has been the administration of GH to adults with a history of childhood-onset GH deficiency, in whom GH therapy has generally been discontinued at the time of epiphyseal fusion or the attainment of predicted final height. In contrast to patients with adult-onset GHD, the initial diagnosis of GHD in adults with childhood-onset disease is made with the accepted pediatric standards during childhood. However, the investigation of bone metabolism in this population has been limited by a lack of long-term controlled studies and difficulties in assessing physiologic vs pharmacologic GH replacement. A number of studies in such patients have shown consistent effects of GH administration on markers of bone turnover, but the long-term effects of GH on bone mass remain controversial. Because of this, the study of the effects of GH administration on bone in adults remains an active area of investigation. Early studies of GH administration in adults with childhood GHD utilized changes in bone turnover markers as a primary clinical endpoint. These studies have demonstrated that GH reproducibly stimulates markers of bone formation and resorption. Johansen et al. (32) studied 21 adults, 11 of whom had isolated GHD and 10 of whom had panhypopituitarism diagnosed in childhood (32). All had been treated with GH in childhood, but had discontinued GH for at least 6 mo before the investigation. GH administered daily for 4 mo in a placebo-controlled crossover trial produced a significant increase in the serum osteoblast marker osteocalcin (see Fig. 1). Urine levels of hydroxyproline, a marker of collagen breakdown, and a less specific marker of bone resorption also increased with GH administration. Further investigation in the same group of experimental subjects demonstrated that the more specific urine bone resorption markers, pyridinoline and deoxypyridinoline, also increased significantly and correlated highly with levels of osteocalcin (32). Later studies of GH administration in adults with childhood-onset GHD have evaluated GH effects on both bone-turnover markers and bone density. One such study of 14 GH deficient adults (eight of whom had a history of childhood-onset GHD) evaluated the effects of GH administration in a 6-mo, randomized, crossover design (34). Although levels of alkaline phosphatase (a nonspecific marker of osteoblast activity) increased, no change in spinal bone density were seen at 6 mo. Degerblad et al. (35) studied six patients, five of whom had childhood-onset GHD, who received GH for 24 mo (35). By 6 mo, a significant increase was seen in serum levels of the amino-terminal propeptide of type 3 procollagen, a serum marker of bone formation. At 18 mo, significant increases in both cortical (5%) and trabecular (18%) bone density were seen as measured by single photon absorptiometry of the proximal and distal forearm, respectively. A subsequent study of men with a history of childhood-onset GHD receiving GH for a total of 18 mo reported that levels of the bone formation markers carboxyterminal propeptide of type I procollagen and osteocalcin increased by 3 mo, peaked between 6 and 12 mo, and then returned toward baseline (36). Significant increases in bone density of the forearm and lumbar spine were demonstrated at the 18-mo point. Bone density was assessed in another open-label extension of a brief placebo-controlled trial of GH in patients with a history of childhood-onset GHD (37). Single photon absorptiometry of the forearm was performed at 7 and 14 mo during GH administration and demonstrated a 4% increase in bone mineral content over this period. O'Halloran et al. (38) studied 12 patients ages 16-30 with childhood-onset GHD (38). After 12 mo of GH administration, bone density increased in the proximal and distal forearm in an open label phase of the protocol. In contrast, Balducci et al. (39) administered GH for 12 mo to a group of 13 patients with adult-onset GHD, 10 of whom continued treatment for a total of 24 mo. Significant increases in the bone formation markers osteocalcin and alkaline phosphatase and the bone resorption marker urine hydroxyproline were seen at 12 mo. However, bone density of the lumbar spine as measured by dual photon absorptiometry showed no change at either time point. Fig. 1. 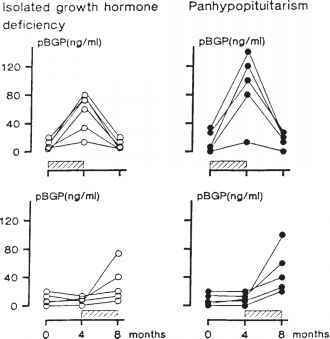 Individual plasma concentrations of BGP (pBGP) in patients with isolated GH deficiency and panhypopituitarism during treatment with hGH or placebo. The hatched areas represent the active treatment periods. Although increases in bone turnover have been consistently demonstrated in studies of GH administration to patients with childhood-onset GHD, increases in bone density have not. This may be owing in part to variability in doses of GH, duration of treatment, and methodology of bone densitometry. The majority of studies have shown improvements in bone density, but only during open label, noncontrolled trials. The role of such variables as drift in bone densitometer measurements and change in patient diet and exercise habits cannot be entirely excluded. Daily doses of GH also varied widely, from 0.04-0.1 IU/kg (approx 13-33 mcg/kg) with frequent reports of fluid retention and elevated levels of IGF-I. It is therefore unclear whether in some cases patients received a pharmacologic intervention that would be impractical or unsafe over the long term.